Australia is known for it’s warmer climate and blistering summers which makes going for a swim one of the best ways to cool off. Pool construction is more affordable than ever and as a result having a home or motel with a swimming pool is very common these days. Every Australian has the opportunity to enjoy themselves in the water. With the explosion of pool ownership, drowning has become one of the leading causes of death in children under the age of 5 years old. In order to combat this, pool safety laws were introduced and the requirement of a QLD pool safety certificate. This is essential for anyone with a pool. All swimming pools and spas in Queensland need to be registered and fenced, if you are found to have an unregistered pool on your property or business, you can face a fine of up to $2,356.00. You can register your pool online, or if you aren’t sure whether your pool is registered you can search the pool safety register. 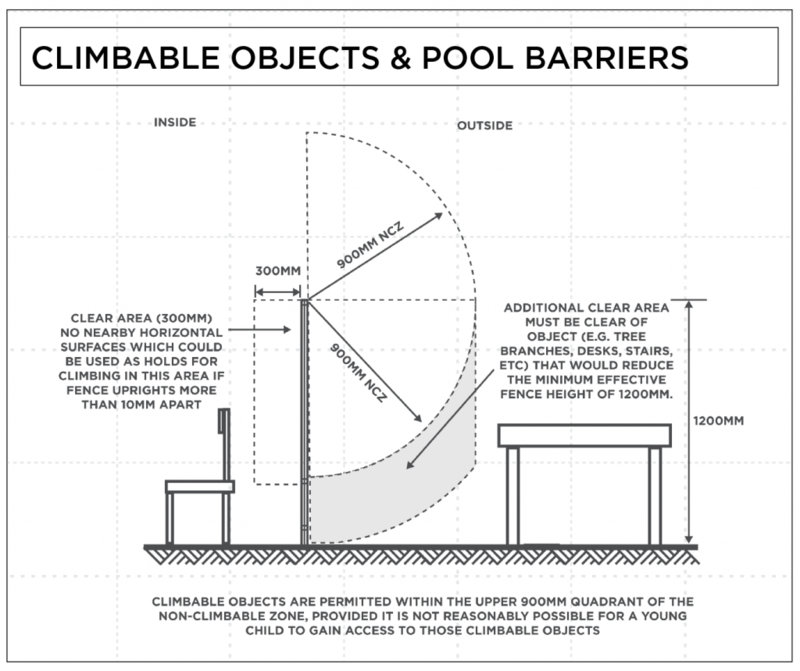 The pool safety standard covers all aspects of the pool fencing including the height and strength of barriers, adhering to compulsory non-climbable zones, specific gate & latching requirements and ensuring no one can enter a pool area through a building. Prior to Quality Building Reports conducting a pool safety certification, please consult the below checklist to determine whether or not your pool fencing will be compliant. If your fencing meets all of the below criteria, you should be able to book your certification and pass on the first attempt. Minimum height from ground to the to top of the fence is at least 1200mm. The space from the ground level to the bottom of any barrier is 100mm or less. There must be one gap of at least 900mm between any horizontal rails on the outside. 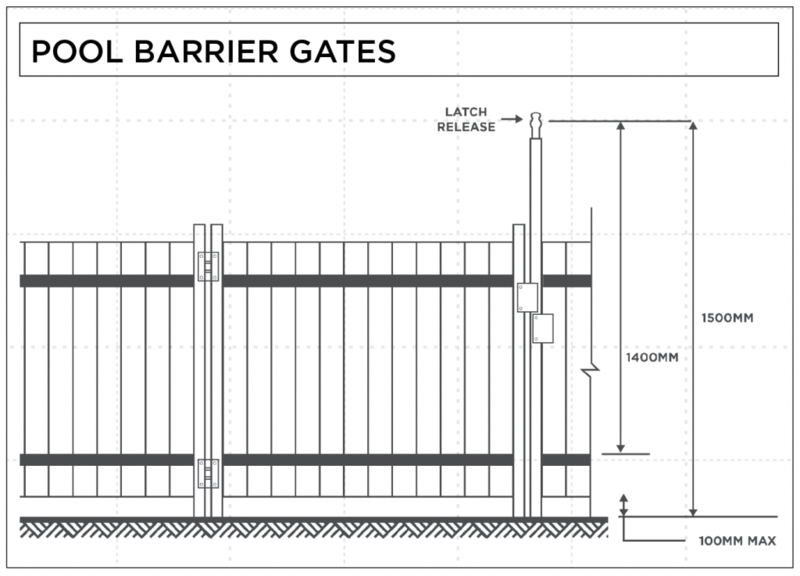 Gaps in the vertical members of the fence must not exceed 100mm. If the fence is less than 1800mm high, any climbable objects outside the fence must be at least 900mm away. Also, if the vertical members of the fence are more than 10mm apart, climbable objects inside the fence must be a minimum of 300mm away. For fences at least 1800mm high, the 900mm non-climbable zone may be on the inside of the fence and must be measured from the top of the inside. This could be useful for a boundary fence, for example, where it is difficult to make the non climbable zone outside the fence . Make sure that there is nothing underneath this zone that a child could jump on to, which would reduce the effective height of the fence from the minimum 1800mm. Pool gates must not open inward and must be self closing as well as self latching from all positions. Latches on the the gate must be at least 1500mm high from the ground level and 1400mm from the top part of the lower horizontal railings. 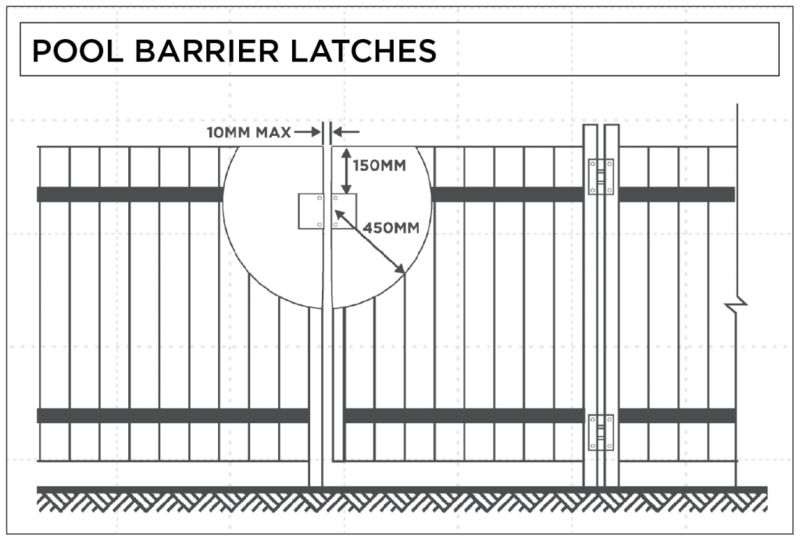 If not, the latch must be located inside so that it is necessary to reach over or through the fencing at a height of not less than 1200mm above ground level or at least 1000mm above the top part of the lower horizontal railings. It must also be 150mm below the top of the gate or the edge of any hand hole opening and, if necessary, covered with a 450mm radius shield with no openings greater than 10mm. Pool gate hinges thicker than 10mm need to be at least 900mm apart otherwise the lower hinge must have a non-climbable (sixty degree) safety cap fixed to prevent climbing. There can be no direct access points to the pool through another building. If there are any windows opening onto the pool area, they may not open any more than 100mm or have a security screen attached. A compliant CPR sign must be displayed at all times. It can be attached to the pool fence or displayed near the pool. The sign must be easily visible to anyone in or around the pool. show how to perform CPR in line with the nationally recognised technique. be attached to the safety barrier of the pool or displayed near the pool and be easy visible. include a prominent statement explaining how to act in an emergency (e.g. call Triple Zero, stay with the injured person, provide first aid). 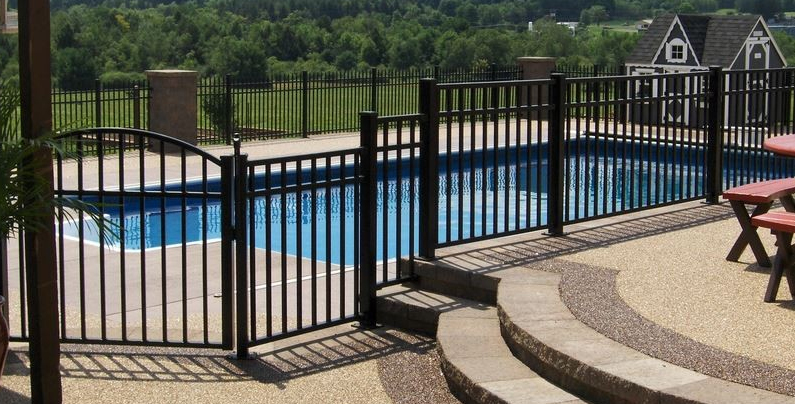 If you are confident that your pool fence and pool area meet the above minimum standards, you are now ready to book your pool safety certification now. You can contact a pool safety inspector such as Quality Building Reports to find out what you can do to make your pool area comply. Alternatively, we can still perform a formal swimming pool safety check with the view to getting a certificate (for peace of mind). Please bear in mind that if you choose to get a formal inspection and your pool doesn’t comply, you will receive a non-conformity notice. If you don’t request a re-inspection within a 3 month period, by law we have to pass on a copy of the notice to your local government. If you are ready to go ahead with your Queensland pool safety inspection and you are located in Brisbane or the Gold Coast, please call us on 1800 762 413 or send us a message today.